THE BRITISH RAILWAY STORIES LTD: "These are the stories we tell..."
companies, formed during the 1923 grouping act in Britain. but left an ever lasting impression of Luxury, prestige and speed. In April 2007, a group of English students were given their module titles for their first year at university. One of those modules was Language and Communication, and involved a film project. After much discussion, it was decided to make a Children's series for Youtube. It had to be educational, historical and above all – fun to watch. Not only that, but it required a certain amount of views over a year, and to fulfil the conditions set down by the course. But what to film? Many ideas were tried out – stop motion plasticine films about a dog and his bone, animated features about ocean liners and their trips around the world – all ideas that were put into the mix. Then one day, in a meeting at the home of group director, Simon Martin, the old Hornby train set was discovered...and thus, the first seed was sown. Initially the series was researched with a certain little blue tank engine in mind. However, the more the team researched series similar in setup, the further away from their minds was the Reverend Awdry's creation. You see, the series had to be historical, and by that, fully accurate with regards to liveries, time period, locomotives and rolling stock. The first trailer, which by then had a new title - “The British Railway Series: The End of the LNER” was broadcast on July 15th 2007, and featured an as yet, unnamed locomotive – a blue Peppercorn A1 pacific, without a face, and pulling a train of maroon Gresley coaches. It was here that the first dilemma appeared. On the one hand, the series was going to be very similar in style and setup to the little blue tank engine – how to set it apart from that series? The solution came in the characters, and the scripts that followed. Between the July trailer, and the final, fifth trailer which arrived on August 20th, a group of five locomotives had been procured and given their names. It was to be a wholly more emotive series, with friends separated, reunited, rebuilt and even renamed along the way. It is not unfair to say that the series became the brain child of its director, Simon Martin – more than anyone else on the series, he had worked long and hard in creating the characters, writing the scripts, and researching the time period and location “The British Railway Series” would be based in. “My first character was Stephen – this one was very easy. I had an old Hornby B12 model, that had been named Stephen by my father and I for as long as I remember – the reason? The original designer of the real class was Stephen Holden, and my father and I being steam enthusiasts, gave it an appropriate name. The engine itself was quite elderly, so it was natural that the character of Stephen would be the oldest of the engines in the series. He first appeared in episode one, and has appeared in every episode since – and remains the only engine to do so”. By the time episode one had been scripted, then approved for filming, filmed and edited, it was clear that the series was not going to be a one-off episode. Around ten scripts had been written by then, and more, interesting, characters were popping up all the time. 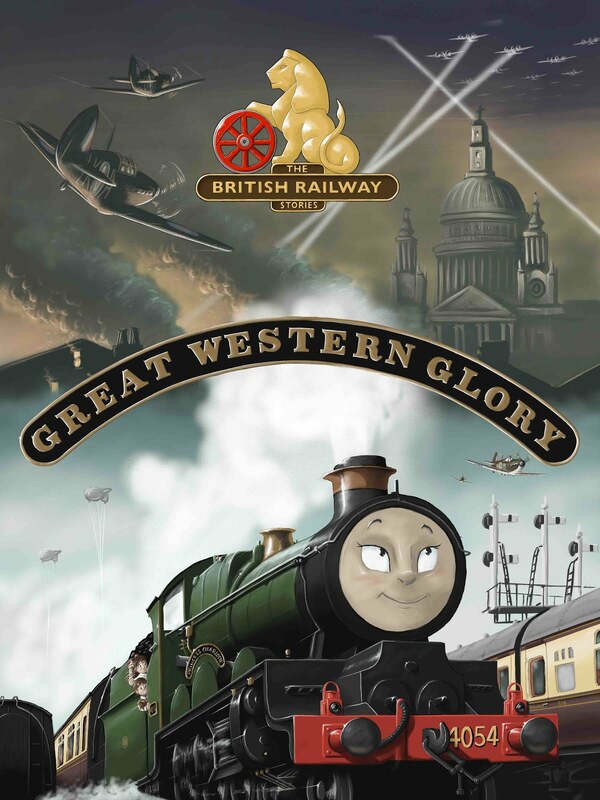 Episode one, titled “A great problem goes west!” was the first story of the engines Allen (the young Peppercorn A1 Pacific), Stephen (the wise and elderly Holden B12) and Sir Ralph (the haughty A4 pacific). The story revolved around an old Great Western engine needing help getting back to the Western Region of British Railways. Allen was chosen to pull the train, and several mishaps along the way led to a happy conclusion (this episode was set in 1951, and the course of the first six episodes were spread, chronologically, over the years 1951-1952. Episode Seven is of course set a the end of 1952). There are several, deliberate, references to the Reverend Awdry's “Thomas' train” story, in which the plucky tank engine forgets to bring his train with him. The BRWS team (the name the students decided to give themselves) were all fans of the books when they were younger, and their first episode was in fact dedicated to the “The Railway Series” (from which the series gained its name). The episode had a mixed reception. The faces, made from a special modelling clay, were a hit, but the filming and set were not up to scratch, and in fact many alterations were made over the course of the first six episodes. By the time episode five had been released, the series then had Herbert (the nervous V2) and Nigel (the cricket loving V3). Both of these characters have proved popular, and have had some great moments in the series - “the bull was in the tunnel...the bull was in the tunnel? !” (Episode four: “Nigel, Herbert and the Cows”). Many things were learnt over those early episodes, in that first few months. By the time episode six was being approved for filming, the set had been adjusted slightly, a new camera had been procured, which specialised in model filming, and the characters had started to settle into particular roles. They were by no means one dimensional characters – Sir Ralph, of course, is the best example of this. Originally a very haughty, arrogant engine, Sir Ralph's background and mishaps formed a story arc that started in episode one, and came to a head in episode ten, “The Legacy of Gadwall”. Sir Ralph developed into a thoughtful, emotive locomotive with many character flaws – and of course, positives. The series was developing into a complex look at the development of the Eastern Region of British Railways in the 1950s. Subjects like the “Modernisation Plan” of the British Railways board, scrapping of steam locomotives, and the onset of diesels appeared, giving the series a very real and historical perspective of British history. One thing that made the series stand out was its very distinctive style and music from the outset. An orchestra was hired in to record a version of “Rule Brittania” for the intro, and a local student rock band were hired in to perform a remixed version of “The Dambusters March” for the end credits. The original ambient sounds and effects were donated by several members of the MTF forum, and their names appear in the credits of every episode as thanks. By episode 8, released at the end of March 2008, the set had been re-designed, and the name of the yard – always referred to as “the sheds” or “the yard” was now revealed to be Copley Hill, a real life set of ex-LNER sheds in the Leeds area. The set was re-designed to better look like Copley Hill in real life, and the re-development of the set continues well into the next planned episodes over the course of 2008 and 2009. The series had seen several guest engines appear from other regions of British Railways, to acknowledge the other regions and leave openings for the possibility of other series. These guest engines helped to cover up a few mishaps of the early set (like malfunctioning models and track work), and not only that, produced some very memorable episodes. The series has a finite length, as per the original directive of being historical. The series will finish in the year 1967, when the last of the ex-LNER express locomotives leaves the rails for the scrapyard, and it's a certainty that only a few locomotives (including Scott the A3 pacific) will survive.